St Johns the Evangelist | church gardens as allotment? It is a very British national shortage with waiting lists running into years and even, in a few cases, decades. 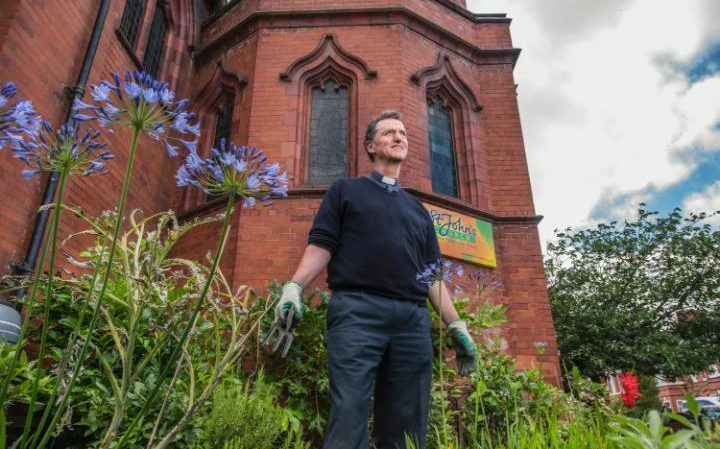 But green-fingered Britons whose faith in ever reaching the top of the queue for an allotment is faltering could find their prayers answered – thanks to the church. 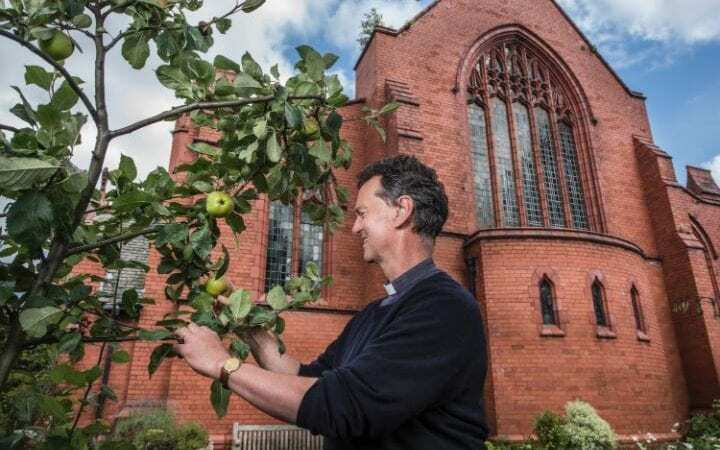 A small but increasing group of parishes in England are giving over parts of their churchyards or neglected land around their buildings to cultivating fruit and vegetables amid surging demand for grow-your-own food. Clergy hope the idea will help churches forge new ties with their surrounding communities, many of whom have never attended services, as well as creating their own local Eden in often deprived inner-city areas. The Church of England’s 10,000 local churchyards have been described as being like an extra national park. It is unique in owning land in every neighbourhood of the country. And while much of the land in churchyards are given over to graves, ancient trees or have historic importance other areas have long been neglected. At St John The Evangelist, Old Trafford in Manchester – a traditional red-brick city church surrounded by rows of terraced houses – the standard smattering of roses and concrete paving has given way to everything from carrots to cape gooseberry as well as flowers in spaces in between. A diverse band of local volunteers have recently been experimenting with growing kiwi fruit and, thanks to the installation of a new polytunnel in the churchyard, their first crop of melon. Unlike private allotments, the parish has put up signs inviting neighbours and passing schoolchildren to help themselves to anything ripe but also to make use of the watering cans left out to tend to the plants. The vicar, the Rev John Hughes, who draws inspiration from the guerrilla gardening movement and St Francis of Assisi, said the initial impetus had been to make the churchyard more welcoming and less like a “fortress”. “It could look like a forbidding space,” he said. “Church grounds don’t say ‘keep out’ but sometimes that’s the feeling, so we wanted to make it much more [obvious] that you can come in. “Unlike your own allotment, what we grow we expect the community to harvest, so it’s very permissive …. but people don’t abuse it. For those who catch the gardening bug in earnest the parish also has strong links with the local allotments. In a parish in which around 40 per cent of the community is Muslim, the garden has also been a powerful tool in building new links. Cath Wade, the parish gardener, who oversees the plot, said: “Some volunteers have been returning for years. “People walking past often stop to speak to gardeners: it can be a thank you, a memory about a plant, an enquiry about what the buildings are for, a chance to let people know they can go into the church for a look, a request for a plant, a piece of gardening advice, someone in need of a bit of human interaction or wanting to give us some encouragement. “Rather than the garden being damaged, people bring us plants and equipment. It is a similar scene at All Saints church in the centre of Wolverhampton in which local children grow carrots and other crops in the church garden. Meanwhile at another All Saints – this time in Nottingham - a corner of the churchyard has been given over to cultivation by a group of refugee and asylum seeker women from across Africa and the Middle East who have formed a gardening and cooking club. Dianne Skerrit, the project organiser said: “When they meet on the first Thursday of each month they have a sub-group who have planted vegetables and herbs, and much joviality and wonder occurs due to not being able to understand why plants don't grow quickly as they would in a warmer climate, and also how the water lingers on the top.